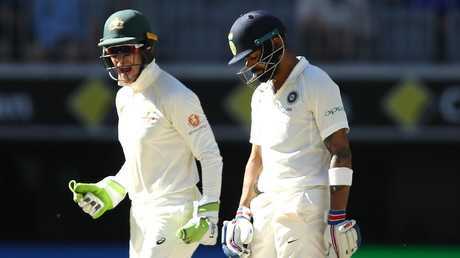 INDIA have the upper hand after another slow day of Test cricket saw the tourists whittle away at the Aussie attack before declaring at 7/443. Cheteshwar Pujara crawled through to his second century of the series, building a demoralising 170-run partnership with Virat Kohli to exhaust the home side under the hot sun. Rohit Sharma (63*) and Rishabh Pant (39) upped the ante late in the final session before Kohli put his hand up to declare, giving the Aussie openers a nasty 20 minutes against the new ball before stumps. The MCG continued to take fire from cricket fans after producing another lacklustre pitch on Boxing Day. India played through a near carbon copy of day one, scoring at little over 2.5 runs an over before declaring at 7/443 half an hour before stumps. Just two wickets fell for the visitors in the first four hours before Australia's attack finally saw results, however small, from their two days of toiling away on the lifeless track. There's simply no sugar-coating it, the first two days of the Boxing Day Test have been an absolute snoozefest. Last year's pitch was famously rated "poor" by the ICC after Australia's draw with England, meaning the spotlight is firmly trained in on Melbourne this year to produce a good result. 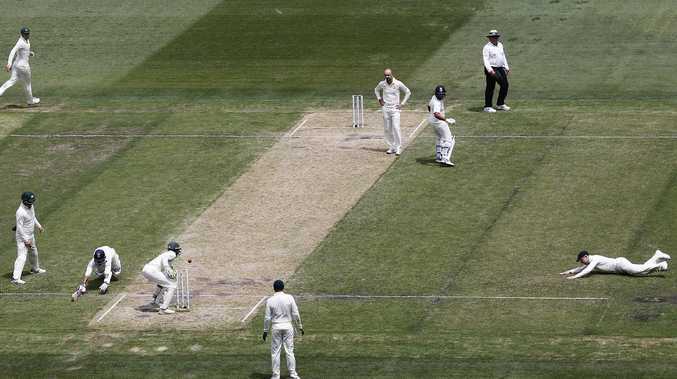 It's a disappointing turn for Australia's biggest cricket match of the year, which until 2014 produced a 16-year streak of contests without a draw. 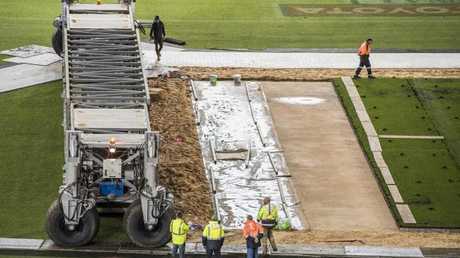 "The 'G has produced remarkably flat decks for several years now," Mason wrote. "The MCG needs to lift its game or lose its showpiece. "The answer could lie in moving the Boxing Day Test to Adelaide or Perth. Both grounds served up great Test match pitches that led to pulsating contests between India and Australia." Hearty Victorian Shane Warne immediately shot back at suggestions the Boxing Day should be moved west. "Sorry, Perth, but The Boxing Day Test is never leaving Melbourne, it ain't happening," he said after stumps. "Here's what you could do, you could ship your pitch over. Or why not put the lights on and have a day-night Test match? A low-skidding ball from Nathan Lyon to dismiss Ajinkya Rahane after tea gave bowlers a sliver of hope in the pitch producing some fruit late in the game, while an attempted hitout by Rohit Sharma in the final hour gave fans some much needed eye candy. But it wasn't enough to stem the wave of viewers out in force taking aim at another so-so day of cricket. Aussie skipper Tim Paine won the nation over last Test after being overheard probing Murali Vijay behind the stumps. "I know he's your captain but you can't seriously like him as a bloke," Paine said, referencing Virat Kohli. In Melbourne, the 34-year-old was at it again. Midway through the afternoon session, Paine began prodding at new batsman Rohit Sharma under the lid as India fought back from losing two wickets after lunch. "It's a toss-up who I support between the (Mumbai) Indians and the Royals in the IPL," Paine said. "If Rohit hits a six here, I'm changing to Mumbai." The Aussie captain continued his spray the following over. "Is it true Rohit? Did Finchy get you out?" he said, pointing to Aaron Finch in short. "To be honest, the hardest two overs I played in domestic cricket last season were from him." "He's f***ing done it again. How dumb are ya?" Starc erupted. The Aussie seamer was later belted for four thanks to a glorious straight drive from Pant, but got his man shortly after. The young Indian keeper top edged a short ball and sent one flying in the air to Usman Khawaja at point, gifting Starc his second wicket of the innings as he finished with 2-87. Peter Siddle dropped an absolute dolly after being brought on the field for an over as Pat Cummins had his foot strapped on the sidelines. Nathan Lyon forced a top edge off a sweeping Rohit Sharma, who sent the ball ballooning up to Siddle at leg gully. The substitute fielder and longtime Aussie quick was distraught after fumbling the cherry, granting India a life in the evening session. Lyon didn't have to wait long for his first wicket, though, sending Ajinkya Rahane on his way the following over after trapping him LBW with a low skidding ball. But the Aussie off-spinner couldn't believe it when another chance was put down late in the day. Rishabh Pant danced down the wicket and heaved Lyon straight to Pat Cummins at long-on. Cummins completely misjudged the catch and fell to his knees as the pair ran through for a single.